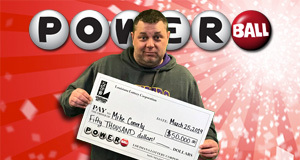 Congratulations to McComb, MS resident Mike Conerly on his big Powerball win! Mike was out for a (motorcycle) ride with his father-in-law and a few others when they decided to stop for Powerball tickets at Kentwood Food Mart. Though the winner is not a frequent player, he decided to try his luck at the large jackpot. Mike matched 4/5 white balls plus the Powerball to win $50,000.